If our students are able to adequately communicate their needs – whether they’re hungry, thirsty, hurting, etc. – then we can better serve them. Feeling “heard” in one’s daily life can lead to a more positive self-image and improved state of mental health. We separate self-esteem from self-confidence here to stress that our students will not only feel better about themselves but that their Life Skills will also increase as a result. Students who can communicate more effectively become more independent. 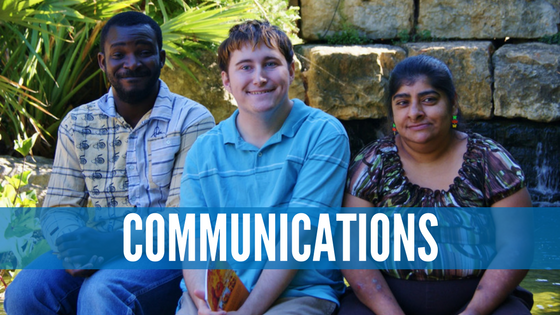 Being able to communicate makes students more likely to form close bonds with their peers and with their teachers. We find that behavioral problems are often tied to frustration at not being understood. If a student can communicate their feelings, they don’t have to express them through a physical outburst. During our Day Habilitation classes, we have time set aside each day to review some basic sign language. This not only helps our students who are deaf and hard of hearing communicate, but it also helps our students who can hear but are not able to verbalize their thoughts. We have PECS in place at ACT to help students who will not grasp using verbal or written language. Using PECS, students can create complex, sentence-like series of images in order to communicate with the staff and their peers. In the event that we’re not able to teach sign language to students with more severe intellectual and physical disabilities, we teach our students about more appropriate or clearer gesturing. Sometimes all it takes it gesturing at an image or item to indicate what a student wants or needs. Dynavox is an example of a communication board. Although we do not personally provide these boards for our students at the center, we are able to help our students who have them better communicate with them. Having a clear schedule and routine in place can help students regularly come into contact with items or services that they might want or need. This repetition can help them gesture, vocalize or symbol to things that they want or need throughout the day.